The Onion Router (Tor), is free and open source software that helps you defend against traffic analysis, a form of network surveillance that threatens personal freedom and privacy, confidential business activities and relationships, and state security. 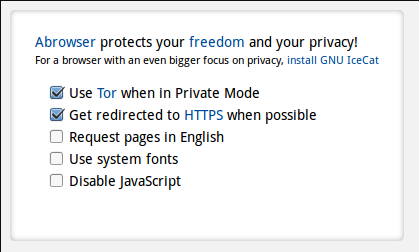 Tor has traditionally been a separate full browser, browser add-on, or proxy software which had to be actively added or configured. Purism, using the Trisquel Abrowser, ships with Tor installed by default, so opening up a ‘private window’ within Abrowser will activate Tor. So now good anonymity online is now one private window away!